Florida has over 1,300 linear miles of ocean coastline, with over 8,400 miles of coastal habitat that could be used by shorebirds and seabirds (hereafter shorebirds). The Florida Fish and Wildlife Conservation Commission (FWC) is working with its key partner, Audubon Florida, to recover shorebird populations using five conservation strategies: reduce human disturbance, manage habitat, manage predation, inform management & track outcomes, and improve regulatory coordination. Monitoring surveys are crucial for measuring the effectiveness of management and conservation efforts and evaluating progress toward achieving population recovery for focal species. 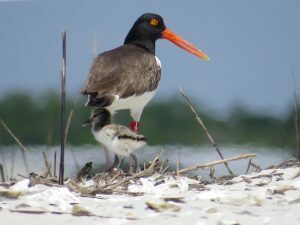 This project expands upon foundational shorebird conservation work previously funded by the National Fish and Wildlife Foundation (NFWF), Natural Resource Damage Assessment (NRDA), and others by inaugurating a dedicated shorebird and seabird program (Shorebird Program) for the State of Florida. 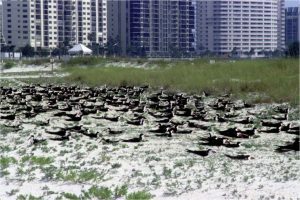 Given the baseline infrastructure that Florida had in place, this grant provides the resources needed to evaluate and refine our ability to detect population changes in species of conservation concern; the ability to measure the effectiveness of restoration, management, and conservation actions; and the ability to understand the ecological processes that affect shorebird populations. 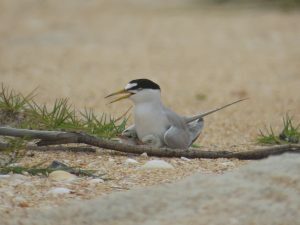 FWC studies have shown that weekly monitoring during the breeding season is necessary to capture peak nesting, to track nest outcomes and determine sources of loss. Conducting weekly monitoring along Florida’s extensive coastline requires an army of partners, the Florida Shorebird Alliance (FSA), with more than 500 contributors to date. Monitors come from a variety of backgrounds, but their professional qualifications do not necessarily dictate the quality of data they contribute. A sound study design and survey protocol, appropriate training resources, user training, and a strong data entry interface with extensive quality assurance measures and an equally strong quality control review process are what determine the quality of the data that are stored, distributed, and used to make management decisions. 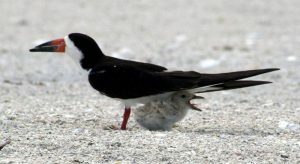 The state of Florida has established two protocols to assess the population status of priority species: TheBreeding Bird Protocol for Florida’s Seabirds and Shorebirds, andThe Florida Monitoring Protocol for Nonbreeding Shorebirds and Seabirds. Florida’s survey protocols were developed by a group of individuals from different entities (including FWC, Department of Environmental Protection, and Audubon Florida). The protocols were vetted through a larger group of FSA partners who conduct the surveys and use the monitoring data to inform conservation and management actions. We designed the protocols to maximize the temporal and spatial coverage of our monitoring given the extensive length of Florida’s coastline. The protocols currently allow us to identify local habitat features that best support nesting, foraging, and roosting shorebird and seabirds, and to assess the effects of management actions and ecological processes on shorebird populations. A foundational goal of the current work is to modify our monitoring in a way to allow us to establish population estimates and trends for five focal species: Black Skimmer, Least Tern, Wilson’s Plover, American Oystercatcher, and Snowy Plover. We are working to enhance and expand the current Florida Shorebird Database (FSD). It will house all shorebird related data assets accessible to FWC in a single location, if those data assets are not otherwise stored in a secure, organized, documented manner by a partner agency. Examples of data stored in the FSD will include: the mid-winter shorebird survey (USFWS), non-breeding shorebird data, banding data, historical data, and project specific data. All data stored in the database will be reviewed for quality, standardized to ensure maximum interoperability, and documented with complete metadata to ensure correct interpretation and longevity. Crosswalk tables will be built and maintained when necessary to related data collected under different survey protocols that are stored in the FSD or when applicable in partner data warehouses. Additionally, the FSD houses all the Stored Procedures, Functions, and Security Permissions required to support data application for collecting, editing, and distributing data. The data warehouse and new FWC Shorebird Program will maximize the following: 1) the number of partners involved in each project, 2) the ability to leverage project data, 3) sharing, standardization, and interoperability of proposed survey protocols, 4) the ability to address priorities established in conservation plans, 5) the applicability of data beyond local monitoring, 6) public sharing of monitoring data, and 7) monitoring program alignment with other entities. This centralized data repository we be designed to maximize availability and compatibility of data allowing other states and entities to intersect with our program as needed. Florida’s shorebird program already produces rigorous data that has improved our understanding of shorebird/habitat relationships and has been used to assess the effectiveness of our management actions. Our current work will build upon recent and ongoing efforts to allow us to rigorously evaluate population trends for the five-focal species. The recent NFWF support for an expansion of staff and resources has allowed the program to expand survey coverage, improve QA/QC functionality, meet growing demands/workload associated with more than 270,000 records in the Florida Shorebird Database, increase staff-led targeted data collection and real-time analysis for rapid responses to emergent management challenges, and provide the analysis support necessary to glean information required to make more fundamental programmatic shifts over time. By having quality data, we achieve benefits in efficiency, increased public confidence, reliability of information, and ultimately learning and improved decision making – all considered benefits and rewards of adaptive management.